Let us rewind a bit though. You will get a slightly different answer from just about every one you ask that question to. And sometimes, a significantly different answer. There are 196 countries (best number I could find, though there is some debate) in this world and hundreds of different cultures and cuisines. 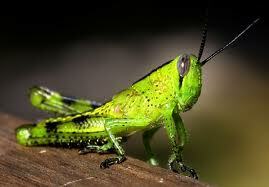 In some tribes, such as Navajo, consuming a smoothie made with protein from a grasshopper is quite normal. BTW, I've had one of those smoothies and... it was quite delicious. Staying inline with that thinking, is healthy eating then, one way to embrace the body (with food), the best way that one knows how? Because of course, we do not know what we do not know. People didn't walk around feeling ignorant when everyone was under the impression that the world was flat, they simply accepted it and went on with their daily lives. And then one day, they knew. And their thought processes adapted. Point being, we are constantly learning and adapting. And I believe the journey of how our bodies respond to food is ongoing and ever-changing. To that end, what I believe is healthy today, may change (even radically change) tomorrow, or the next day, or next year. 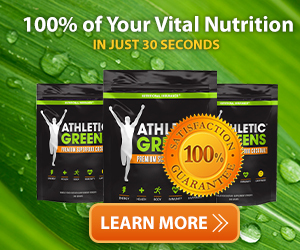 I propose that those that have an awareness that what we eat plays an integral role in our overall health, to eat healthy, is to give our bodies the nutrients that are essential in providing our bodies the support it needs to achieve a feeling of wellness. OK, now that I have started the intro to some unknown thesis... below is Part One: 'Finding Time to Prepare Meals,' in 'Overcoming Challenges to Eating Healthy' with my tips and suggestions to overcome them. This challenge is quite common And a very real challenge. Especially for those, unlike myself, that are preparing these meals for not just themselves but their families as well. The bottom line, whether preparing for one, six or some other number, is that you must make the priority shift to make 'time to prepare meals,' a TOP priority. "I don't have time to..." can be translated into "I didn't make time to..." Sorry folks, but that's the reality. True, we only have so many hours in day. This means we need to get dang good at ensuring we create the the space and time in our days to get the things done that we deem a priority. So, whether it's a few loads of laundry, going to a 90-minute Zumba class, volunteering at the Children's Library, planning and making meals, walking the dog, taking Jimmy to guitar lessons, catch up on work email, finish an important presentation, watch Grey's Anatomy and Private Practice or finish painting the nursery, we HAVE to pick and choose what we do in a given day AND the amount of time that we dedicate to them. To that end, we must to choose what we can leave off of that list for another day and still be able to sleep at night without angst about not getting them done. We ALL have busy lives. Sure, some may have more going on than others. Though still, it is a choice. I CHOOSE to get up at 5:30AM, walk on the treadmill, take my shower, prepare my breakfast and snacks for the day, go to work, go to yoga (or lift depending on the day), make dinner and then spend time researching or blogging. I could easily not have time to do yoga because I need to clean the house and make dinner. So I do a trade-off (I CHOOSE), the housework can wait for the weekend... ;) I could also choose to not go to yoga or spend time preparing a healthy dinner and go to a social function instead (for example). In the same way that many newer companies are embracing the value 'work-life-balance,' we must balance our personal lives as well. For each day, we wake and we must eat. Yes? So then, we will either mosey into the kitchen and pop some pop-tarts in a toaster (and be hungry an hour later) OR we can take a few extra minutes (literally, a FEW), pour some EVOO into a pan, crack some eggs, whip them up with some spinach, slice and apple and scoop out some almond butter. BAM. Whoa... is it that easy? Yeah, pretty much. BUT, that shifting in priority is not always easy. AND the knowing WHAT to eat is not always easy either. 1) Wake at least 30 minutes earlier. Why 30? Well, I was going to say an hour because I LOVE a leisurely morning, but 30 minutes will allow you the space to give thought to what your body needs for breakfast that morning and snacks throughout the day. Even if you have spent time the evening before planning things out, you may change your mind (this is good as you are listening to your body!) and you want give yourself that time to do what is right for your rather than piling some things in a bag and rushing out the door. 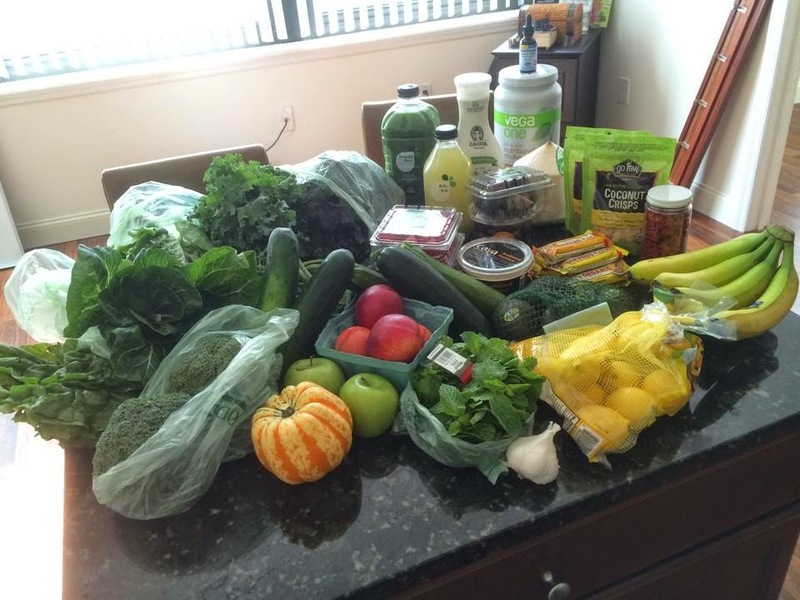 2) Build your grocery shopping list throughout the week. During the week, we pin, email, bookmark, Facebook and Twitter all of these recipes that we want to try (and often times 'quick' recipes) and then we forget about them and proceed to create a grocery list with a bunch of non-cohesive items. I keep my list in the notepad on my phone. 3) List out the meals you will make from your grocery list. Preparing meals does not have to hours worth of work. Whether it's breakfast, lunch, dinner or everything in between, know that you can still have a healthy meal without 'slaving over the stove.' Think back to some of your favorite dishes while dining out, I'd venture to say that more often than not, the dishes we love the most are those that are super simple yet still seem so very elegant. A touch of truffle oil, hint of basil or splash of lemon can go a long way in turning a 'boring' meal into an elegant dish. Why over complicate things? When you have fresh ingredients in your fridge and pantry, you can easily pull together meals that will naturally be healthy whether you eat them raw or do a quick stir-fry. Combined with 'keep it simple,' you will have a nice, healthy meal that takes very little time. 6). Prepare easy-to-take items for the week on your day-off. For me, this is usually Sunday. 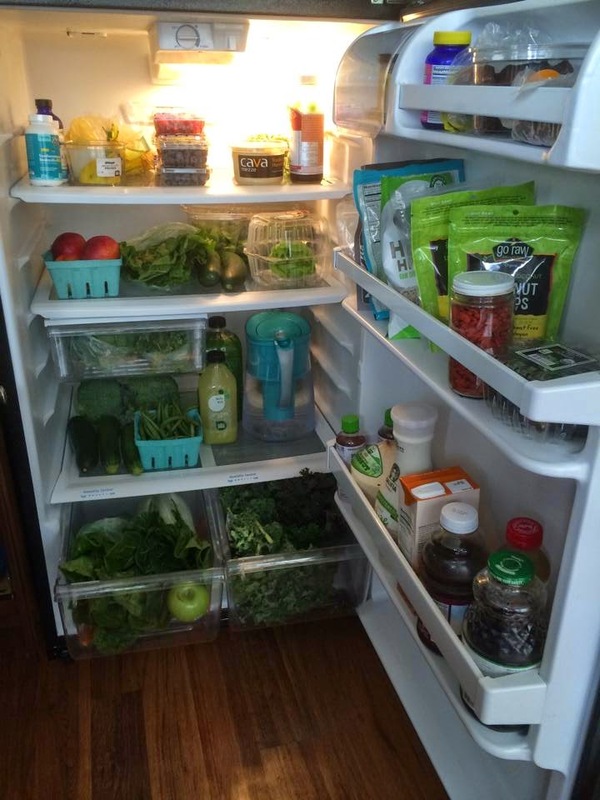 This makes looking into your fridge Monday (or whatever day) morning, less daunting. When you already have food lined up for your week, you not only save time, you have plenty of options to choose from for your day as well. 7). Organize your Kitchen (and refrigerator). Do you ever go to a friend or relatives house and nearly lose your appetite when you open their fridge? Tupperware filled with God knows what, spilled apple sauce on the top shelf, fresh greens stashed in a drawer with the dog's medicine, some fresh berries stuffed in a side door next to a leaky bottle of... something... we've all seen them. Not only does it turn people off, the fresh produce goes unseen (and therefore uneaten) because it's stuffed in obscure locations. When it's not easy to grab or easy on the eye, people will gravitate to what is; which is usually something that is less healthy from the pantry or counter-top because they are overwhelmed. 8). Don't allow vacations and abnormal schedules derail you. 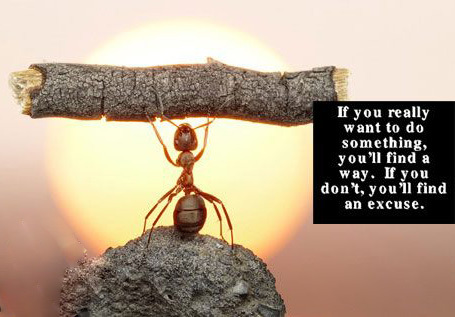 Don't let them derail you OR use them as an excuse. There is a time and place for 'indulgences' though making entire days or weeks out of them because you are not at home can be detrimental to both your physical and emotional well-being. Coming home after a short business trip in which you had a McDonald's Egg McMuffin at the airport, a heavy pasta dinner at a business function and peanut M&M's because you were starving in your hotel room and beating yourself up over all it is going to do more harm on your emotional state than a layer on your belly. 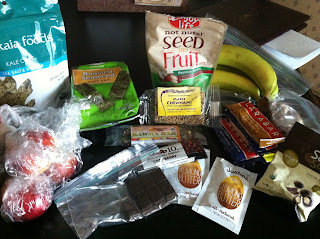 Prep snacks and meals for your trip (whether it's a week or a day) as best as you can. Even fruit can travel well. 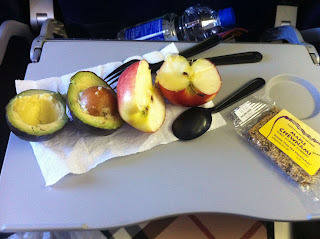 I take everything from avocados to bananas in my carry-on and it has saved me hunger, time, money, physical setbacks and guilt. Once you have all of your essentials with you, there is is perhaps one rule. Rule: Do not be self-conscious of your food in front of others. I don't have specific advice on carrying out this rule other than 'get over it.' I know it can be intimidating when everyone else is having donuts at the conference and you pull out your apple and almond butter- but you know what? It's a moment in time. They will forget, your body will thank you for it and chances are, you just influenced someone else to consider doing the same thing next time. Going on a roadtrip? Take a look at a post that I did on the food that accompanied my roadtrip to Michigan last summer. 9). Communicate your priorities to your family/living-mates. Making your priorities and goals clear will allow you to make this shift more easily. If you want others around you to respect the time that you are dedicating to preparing healthy meals, then communicating to them that you are doing so will be an important step. You may also find that in doing so, others may want to join you. 10). 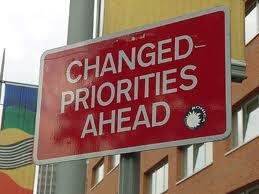 Decide what priorities will shift downward. And with that, I will conclude Part One to 'Overcoming Challenges to Eating Healthy.' As always, let me know your thoughts.